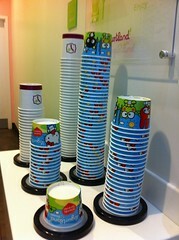 simply suzie: Yogurtland In Jersey! 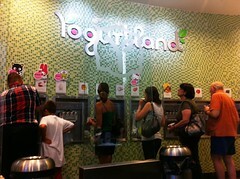 I cannot begin to tell you how exited I was to find out that Yogurtland had opened a location in New Jersey! 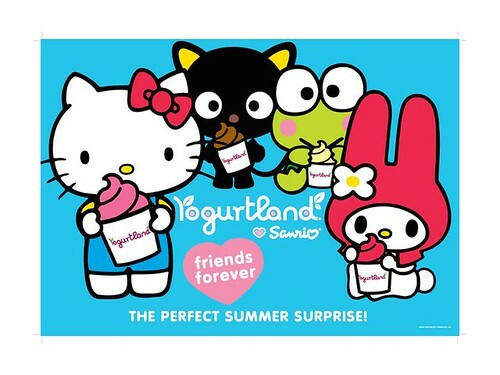 Even more exciting is that they are currently doing a promotion with Sanrio featuring Hello Kitty and other characters! They've been open for over a month but we just hadn't been there yet because we've been so busy. Because I'd had a rough week at work, Friday night Hubby and I decided to take a drive up to the first Yogurtland in Jersey which is up in Hamilton. It's not too far but not too close either (which is probabably a good thing for both my belly and my wallet). Even as we walked up to the front door, we could see the Hello Kitty fun inside! Yes, I am a grown adult, but I love Hello Kitty. You're never too old for Hello Kitty! One of the things I love about Yogurtland is that you get to pick your own froyo flavors, how you want them in your cup (top/bottom/left/right) and exactly how much of each flavor you want to get. This location had 10 froyo machines and from what I recall, the flavors they had last night were: Dragon Passion Tart, Caramel Almond Bar, Chocolate Milkshake, Double Cookies & Cream, French Vanilla, Red Velvet Cupcake Batter, Peanut Butter, Mango, Taro, and Plain Tart. Some flavors are tart and some are sweet, so most anyone would be able to find something they'd likely to enjoy. You even get to pick your toppings and spoon them over your froyo yourself. After sampling nearly all of the flavors, I ended up getting Taro froyo(my favorite) with fresh mango, blueberries and kiwi (pitured above on the left) and Hubby got a combination of Double Cookies & Cream, Chocolate Milkshake and Peanut Butter topped with Oreos and peanuts. It's sold by weight and it was 39 cents an ounce, which I'll keep in mind next time before piling on loads of fruit in my cup. 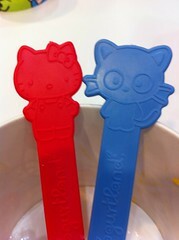 I specifically requested the Hello Kitty spoon for myself and the Chococat spoon for Hubby. My Melody and Keroppi spoons won't be out til August 11th. I'm sure we'll make several more visits to Yogurtland before then, but this also gives me an excellent reason to get Hubby to drive back up there. Because, as you probably figured out, I've got to have one of each of the spoons! 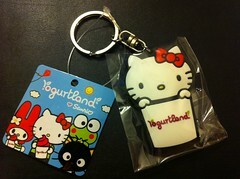 Before we left, Hubby bought me one of their Hello Kitty Yogurtland keychains. It's so cute! Hopefully, next time I can talk him into getting me the t-shirt! Do you like Yogurtland? What's your favorite flavor? Hi! 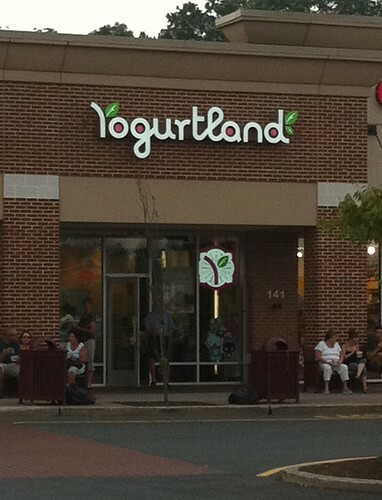 I found your site while looking to see if there was a Yogurtland in Jersey! I just came back from Hawaii and I had my first Yogurtland while I was there and now I'm hooked. 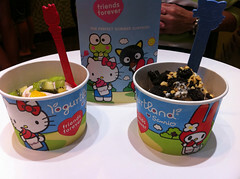 I have to admit that the Hello Kittiness of it all is what lured me to the place, but it was seriously love at first bite. My favorite is the coconut. So good.